Thanks to its superior organization and thoughtful design, the compact Muji Hanging Travel Case / dopp kit is able to hold more than you'd think. Travel cases and toiletry bags are ubiquitous travel accessories. Most anyone who journeys near or far brings any number of grooming and health items. With such a widespread need comes a surplus of options. Don’t worry though. We found one that stands out from the crowd—The Muji Hanging Travel Case. Weighing only 7 ounces (~200 grams) and measuring just 6.3 x 7.5 x 2.4 inches (16 x 19 x 6 cm), someone’s first impression may be that this toiletry bag is too small. But once you open up the main compartment’s zipper, you’ll be surprised by all the attention to detail. There are three interior pockets, all of varying sizes. The top and bottom have a mesh front panel, allowing you to see what’s inside, ideal for when you’re trying to find toothpaste or some Tums after a long travel day. Also, there are four larger, elastic holsters in the main area. At the top is a hook used to hang the case. It’s nestled in a small pouch, hiding it away from accidentally catching on something. Rounding out the features is one large, exterior pocket on the backside. 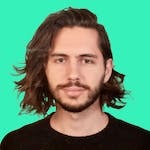 These pieces blend together to create a highly useable product. One of the most functional aspects of this travel case is the elastic holsters. Inside there are a total of nine, all of varying sizes. The top zippered compartment houses five of them. The main exposed area owns the remaining four. 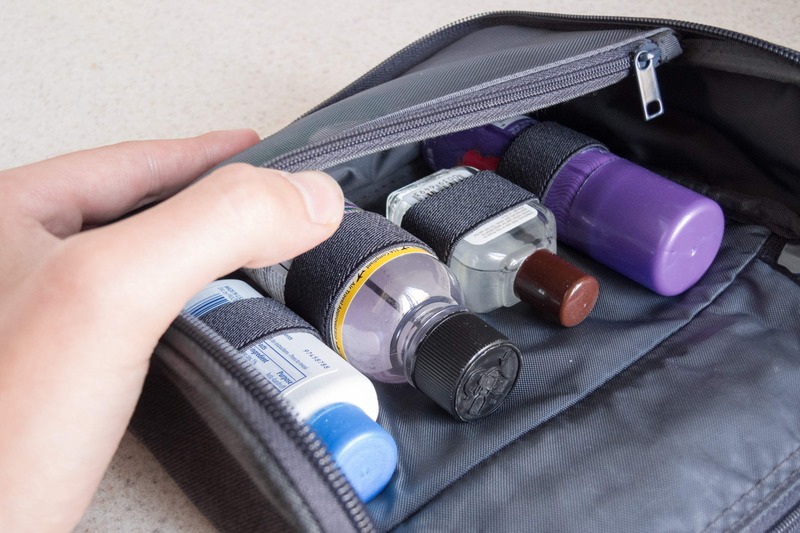 These holsters hold everything in place: shampoo and conditioner bottles; toothpaste; nail clippers; gauze; Vaseline; tubes of medicine; mouthwash; you name it. Without them, there would be no great or efficient way to organize this very tight space; all the items inside would be free to bounce and slide around, causing chaos and disorder. If God really is in the details, this feature of the Muji case is a direct disciple. Another excellent attribute of the Muji hanging travel case is the part that makes it hang: the hook. Though it’s plastic, it feels solid. Even with a full load of toiletries, there was no indication the hook was under any serious stress. Further, the way the hook attaches to the case itself is well done, thanks to a rugged piece of fabric and strong stitching. 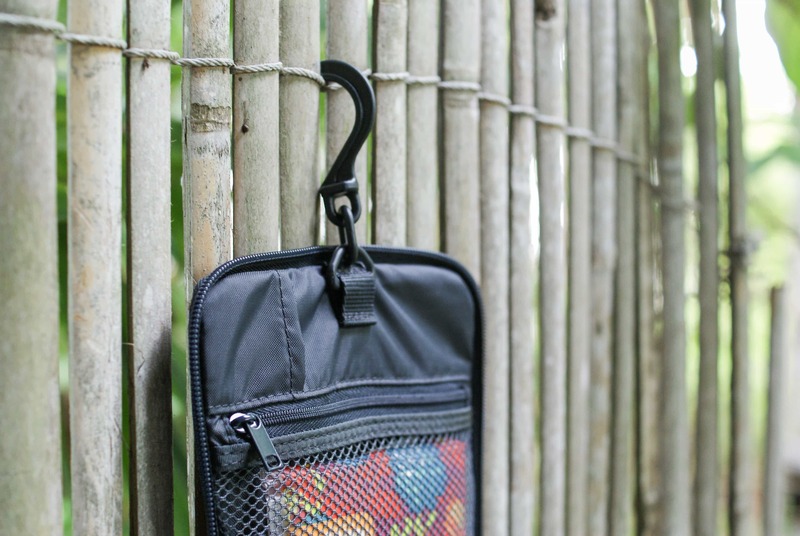 A hook generally isn’t something you would think of needing on a toiletry bag, but we found it quite convenient for freeing up space in the bathroom. Just find a towel rack, some shelving, or the like and hang it. The way this carrier was designed, it’s easiest to access all the toiletries inside when it’s hanging. The remaining elements are well-suited for basic needs. The middle internal pocket is the smallest of the inside three. 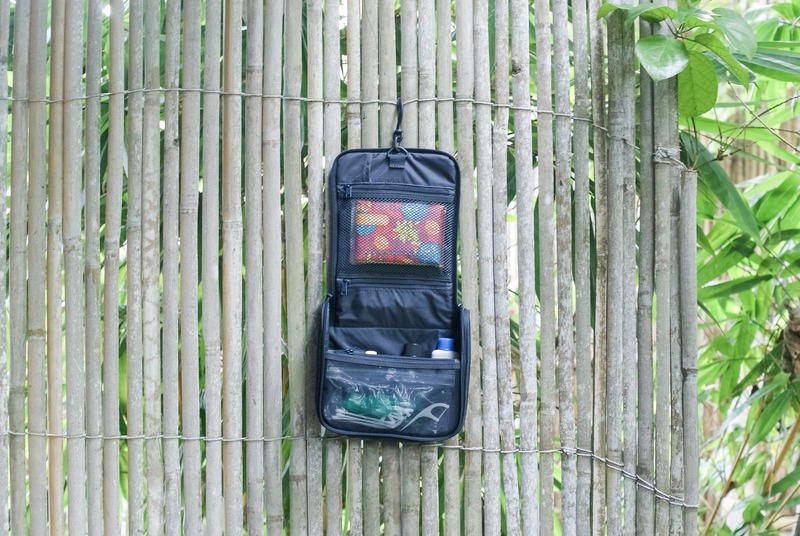 It’s ideally sized to hold bandages, packs of pills, and other small items. The bottom internal pocket is great for things like floss picks, a toothbrush, and a small tube of toothpaste. The back pouch is a nice spot to hold instructions you may need for medication while doubling as a discrete place to hide some cash. Fully packed, the case doesn’t feel bulky or heavy. It retains its sleek design and compactness. Durability seems to be on par with the quality, too; after three weeks of continuous travel, the case looked brand new. And even though the zippers aren’t made by YKK, they feel strong and sturdy. The Muji Hanging Travel Case is a product greater than the sum of its parts. Together, the features provide excellent utility in a small package that punches well above its weight. The quality, color, feel, and design are all supreme. It’s no wonder this product is sold at a New York City museum’s design store. In a crowded market of travel cases and toiletry bags, you’d be hard-pressed to find something better. Looking good out of the box. It looks flawless and is holding up very well. 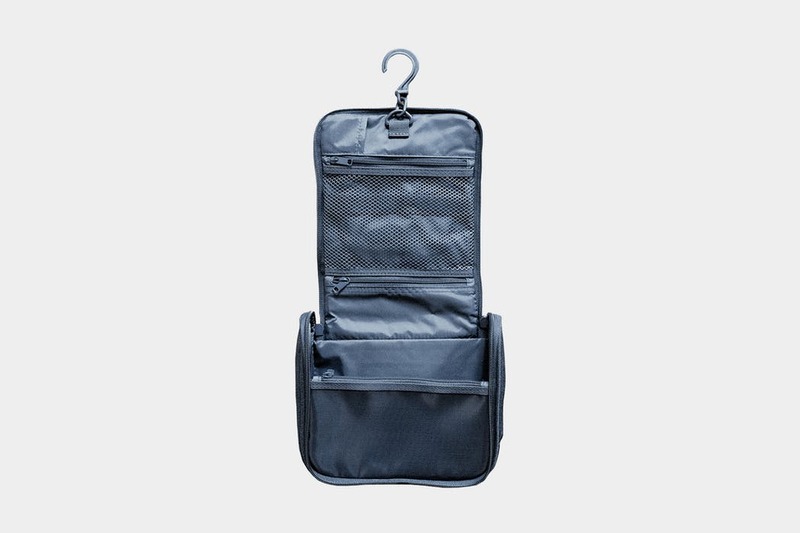 The Muji Hanging Travel Case is a well thought out, high-quality product. It does everything you’d need and nothing you don’t. The case organizes and secures your items with ease while still providing effortless access. Others may say it isn’t as durable as they’d like it to be, but that seems a bit harsh, as we’ve used it every day for three weeks and it still looks brand new. If you’re looking for a sleek, compact toiletry case designed with user-friendliness in mind, look no further.